We had to move so she could get into her fabric totes the other day. She can't have bears holding up sewing production. But today, I'd like to address another subject. The other day, my friend Sir Woodstock, posted the most upsetting cartoon, under the title "Twisted". 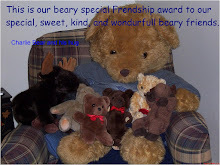 I agree it is beary twisted. I hope that all my readers of the canine species will not be offended by this. But as a teddy bear I find this most upsetting. Mom saw something while shopping last evening that was equally upsetting to me. She took a photo with her cell phone. 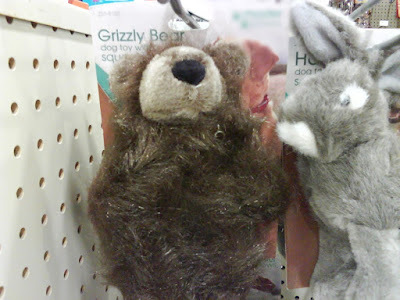 These are teddy bears sold as dog toys. They are handicapped bears, blind to be exact. These people need to be reported to the A.C.T.B.B. (Anti Cruelty to Blind Bears) The bunnys were also blind. Mom said they were probably made that way on purpose. Something about dog safety. Some dogs play very ruff, no pun intended. What about the poor bears and hares? Not even given a chance, they can't see the dogs coming. What is this world coming to? Good luck with the bear orientation. I am in charge of Taddy's orientation. 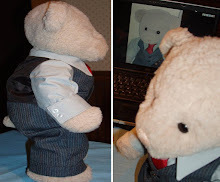 Tonight, Taddy and I are going to do a special post. I think those poor blind bears are being mistreated. Whatever can we do to help them?